There are many free and low-cost DIY nonprofit website providers available (such as Weebly, Squarespace, Wix, and more). They can be a good place to start. 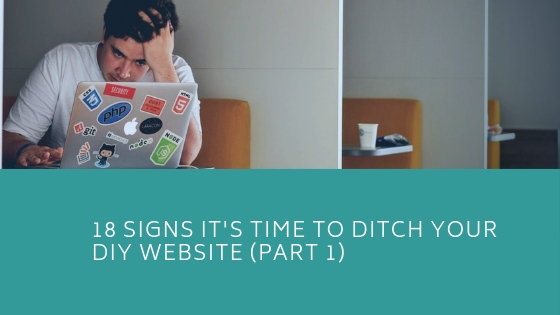 However, you may soon discover that you’re outgrowing your DIY nonprofit website. Check out our helpful hints to tip you off if it’s time to ditch your DIY and move on up. Do you have a cookie cutter website? I distinctly remember, as a young child, being completely perplexed by people who lived in what I called “cookie cutter” houses. Driving through neighborhoods where all the houses looked the same bored me to pieces. Likewise, many of the DIY templates are merely cookie cutter versions of all the rest. This can be devastating for your nonprofit, especially if direct competitors in your industry have nonprofit websites that look just like yours. Don’t get lost in the sea of “me-too” nonprofit websites. Standout by customizing your site and leveraging your unique brand! Does your nonprofit website resemble a grandpa sweater? If so, it’s time to dust off those mothballs and tune up your design. Website visitors are drawn to the latest technology, graphics, and content. Simply put, if you don’t deliver, they will probably go elsewhere. An outdated template or a junked up website questions your credibility. If your website visitors think you’re locked in the dark ages, they’ll probably think that of your products and services, too! Do you get frustrated when you try to get your nonprofit website more in line with your branding and continually face roadblocks with your current website platform? At the risk of sounding redundant, you discover your nonprofit website looks like all the rest (a cookie cutter). See point #1 above. Have you ever felt like pulling out your hair as you sit in front of your computer screen and stare at the template? Do you feel like you’re falling into a trap of insanity (trying the same fix over and over and expecting a different result)? Sometimes all you need to do is make something more user- friendly with a minor customization or add a snippet of code but your DIY system doesn’t easily accommodate your needs. At first, this may not be too bothersome. However, as your business grows and your nonprofit website is used as a tool for true sales and marketing, you may soon realize you’ve outgrown your current platform! It’s crucial your website can grow with you and limitations of functionality are growing pains you may not want to endure! You may be in need of an additional contact form, advertisers on your site, or add a new product to sell. The bottom line is if this is not easily added to your nonprofit website, then the limitations will hinder your productivity, leads, and sales! Okay, so maybe there are ways to add functionality to your nonprofit website but they come at an additional cost. On-going monthly costs add up quickly. How long will it be before your $50/month nonprofit website turns into hundreds per month? Do you know what is the quickest killer to website traffic? That’s right, if your nonprofit website isn’t mobile-friendly, you will struggle! Simply run Google Analytics and soon discover how many people are coming to your site with smartphones and tablets. If your result is less than a few percent, there are probably problems with your site being mobile-friendly. Many people purchase products and services through their mobile devices and this hindrance could adversely affect your business! Google Analytics will shed light on problems and figure out where in the conversion funnel they’re dropping off. When you identify the problems, you can fix them. This will definitely improve your leads and sales. How many times have you been surfing the web searching for a particular topic or product? After scrolling through numerous Google leads, you finally stumble across just what you need. You tell yourself that you will certainly remember where you found this information only to go back later never finding the website, again. It’s crucial for you to capture every visitor to your nonprofit website. Give them a spot to enter their email addresses and obtain their names so you can increase your chances of making future sales. If your nonprofit website platform doesn’t allow for this, it’s definitely time to upgrade! Do your call to action buttons look a toddler’s toy buttons? Your call- to- action buttons need to be eye-catching. Simply changing the appearance of the buttons could improve the overall look to your nonprofit website and improve the performance! You may not be able to judge a book by its cover, but visitors are constantly judging your business by the overall appearance of your website! If your DIY platform is a “closed” system and if it doesn’t offer integration with your other systems, you’re most likely getting locked into something that can stunt the growth of your business. More than likely the online component of your business is not limited to one or two services. Therefore, it is very important to have a nonprofit website platform that allows you to integrate multiple services. I hope these tips are helping you decide whether it’s best to stay with your DIY nonprofit website or consider hiring a professional web-designer (agency). Stay tuned for part two.